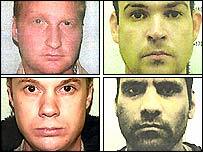 Four members of a drug empire who dealt cocaine to city businessmen and celebrities have been jailed for a total of 36 years. Massive quantities of the drug were sold by the gang, which operated as a business and kept computer records. Ex-public schoolboys Julian de Vere Whiteway-Wilkinson and James Long were sentenced alongside Tom Connell and Milroy Nadarajah on Friday. All four had admitted conspiracy to supply cocaine. Ringleader Whiteway-Wilkinson, 32, was jailed for 12 years and former merchant banker Long, 31, received nine years, at London's Southwark Crown Court. Connell, 30, a jazz pianist, received eight years and Nadarajah, 33, a record producer, was jailed for seven years. The hearing had been told that more than £7m had been spent on cocaine in 13 months from May 2002. That was enough to turn into nearly three million 50mg "wraps" to be sold on at profit. Computer records also showed dealings in ecstasy tablets, cannabis resin and herbal cannabis during the same period, the court heard. Prosecutor Francis Sheridan said: "The arrest and convictions of these four have brought to a halt a major and prolific group of cocaine sellers whose supply activities can only properly be described as being massive." A plastic bag containing £200,000 in £20 notes and a 15kg bag of high-purity cocaine, found at a business centre unit the gang rented in Brick Lane, east London, was shown to the court. Police believe the premises were used to "bulk up" the drugs to increase profits, Mr Sheridan said. Long and Nadarajah were arrested after they were observed by undercover officers carrying the consignment on 5 September, 2003. Detectives have identified £4.5m in assets, but further fortunes could be in overseas bank accounts. Ringleader Whiteway-Wilkinson, the 32-year-old son of a prominent Devon family, who now lives in Buttesland Street, Shoreditch, east London, owned a £300,000 home, a BMW and a share in an aeroplane, the court heard. Nadarajah, who bought a £1.2m home in Games Road, Cockfosters, north London, told the Inland Revenue he earned only £7,943 in 2002/03. Mr Sheridan said: "His home was more akin to Footballer's Wives than an ordinary hard-working citizen." The group, which included songwriter Connell, of Lucerne Road, Highbury, north London, had built up such wealth that Long, who has a Docklands penthouse in Shadwell, east London, had £1,000 in unused coins lying around his flat.